If we analyzed every part of this world and turned it inside out, have you ever wondered what all we would find? I believe that all of us have settled with the fact that there is nothing more real than what we face today, we wish it may not be but it surely is. But from all the myths and facts what do we shape reality as? Many believe that big bang was not true and that the world is flat and not everything is measurable and neither have we been there to see any of this so what do we believe and what not? This has been the question surrounding my thoughts for many years now, to me reality is what I believe but it may not be the universal fact. When something has already been made centuries before we were able to know about it we may make it fit our needs but that would just be adding to it, but as a community we have rarely tried to break the base of something and restart, we believe that if something works then it is true… But if psychology says that “You should rarely take someone’s word for something you don’t know” then how can we settle for some observation that was put into words? This is exactly what makes reality inverse to me, analysis is reality in this world and as long as we do not analyze something ourselves how will it be reality to us? 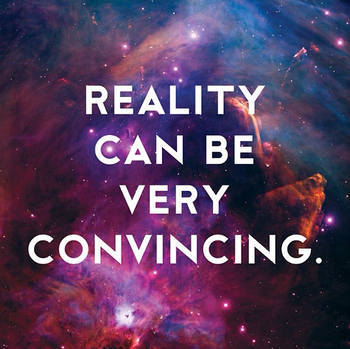 To me reality is my analyzed perception, the principles I have seen and studied to the depth of… Science may shape our perception of reality but isn’t it up to us to believe what we know? To me reality are these words of Albert Einstein, “Reality is merely an illusion albeit a very persistent one”.